A Web Portal for Government School Teachers Launched in Bihar this Saturday. Note that this portal not just improve the quality education but also degrades the Gap between School teachers and students. Bihar education project council says this portal not just bring innovative ideas but also brings new Teaching Methodologies and Practices. You can think of this portal as a digital classroom for teachers. Bihar education department also show their support for this portal. Right now, if you want you can access this portal via the link http://www.teachersofbihar.org/. Two people team behind this portal make this portal happen i.e. Shiv Kumar and Manoj Kumar Tripathy. Let's talk about what features do the portal have. You can think of this portal as a social media portal for teachers where they can share contents. This portal also have an audio-video library, syllabuses available digitally, educational songs, motivational videos. Beside that, the portal also links to Bihar Education Department and different Ministry portal. 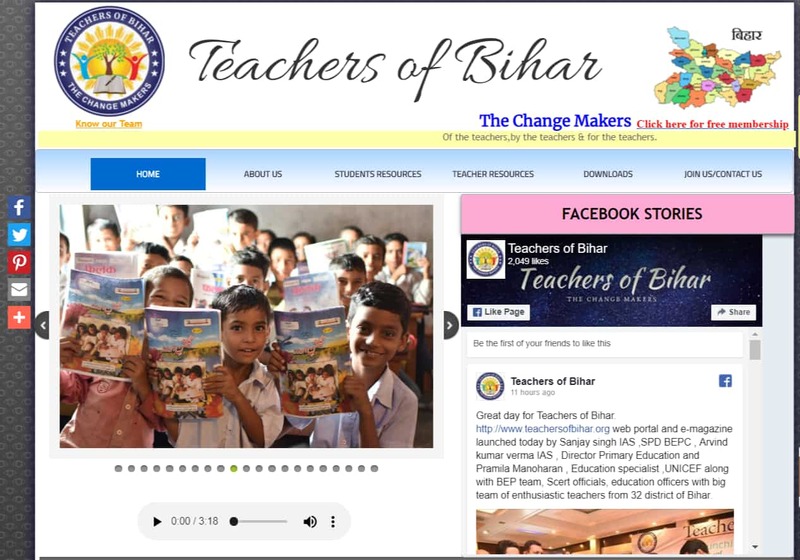 A Web Portal for Government School Teachers Launched in Bihar this Saturday. Note that this portal not just improve the quality education but also degrades the Gap between School teachers and students.